The Game Developers Conference (GDC) in San Francisco is largely a trade show and professional development conference for game industry employees, but that doesn’t mean there aren’t lots of games on display! 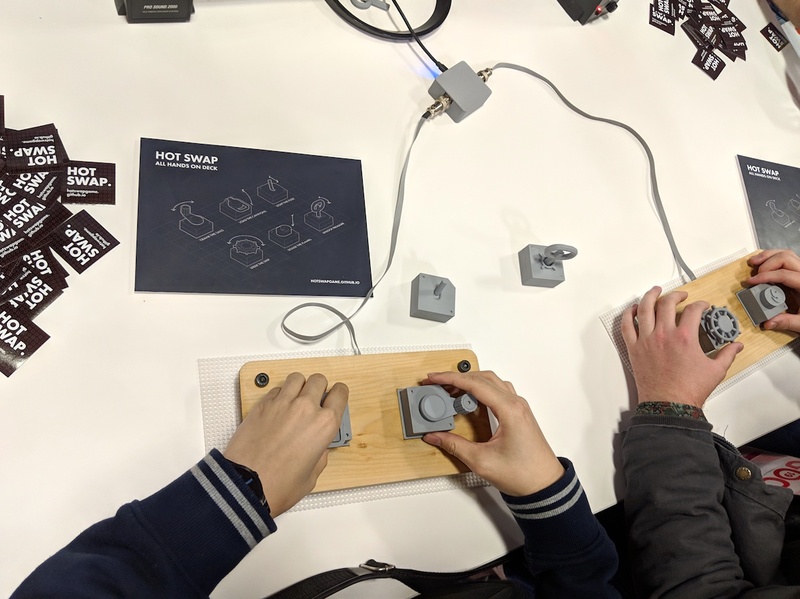 Some developers show off their games as demos for engines or tools; others are shopping around for publishers, partners, or prospective employees; and still others showcase them as part of exhibitions focusing on subjects like indie games or alternative controllers. In between sessions at the week-long conference, I dropped into some booths to try out some of these games. Below I’ve written up my impressions of the ones that stuck out to me. Some of them are traditional video games that are either already available to purchase or will be soon, while others are experimental games that you’ll need to keep an eye out for at consumer-facing game events like PAX. Enjoy! I’m a big fan of TowerFall Ascension , the four-player arena action game from Celeste ’s Matt Thorson. 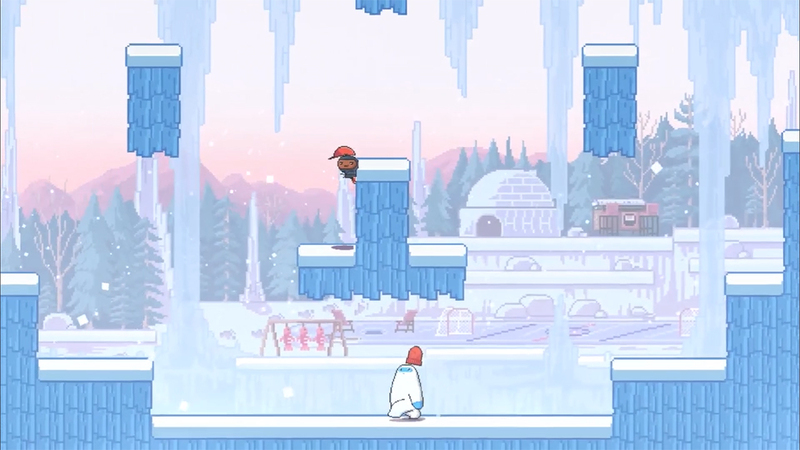 King of the Hat follows pretty closely in TowerFall ’s footsteps but with a few new twists. Instead of archers shooting arrows at each other, each player has a hat floating over their head and can throw it at other players to stun them. But to eliminate their opponents, jumping on the actual character isn’t enough — players need to jump on their hat! This makes for some hectic, high-stakes battles, since every time you throw your hat to attack you’re risking someone jumping on it. On the flip side, a player can intentionally throw their hat to escape an opponent who’s about to jump on their head! The characters are all larger-than-life cartoon personalities — from a cat businessman to a pirate to an entrepreneur/martial artist with a snapback. This is a kooky and nicely balanced little party game, and I wish I had more time to stop and play it on the show floor. It’s available on Discord right now! 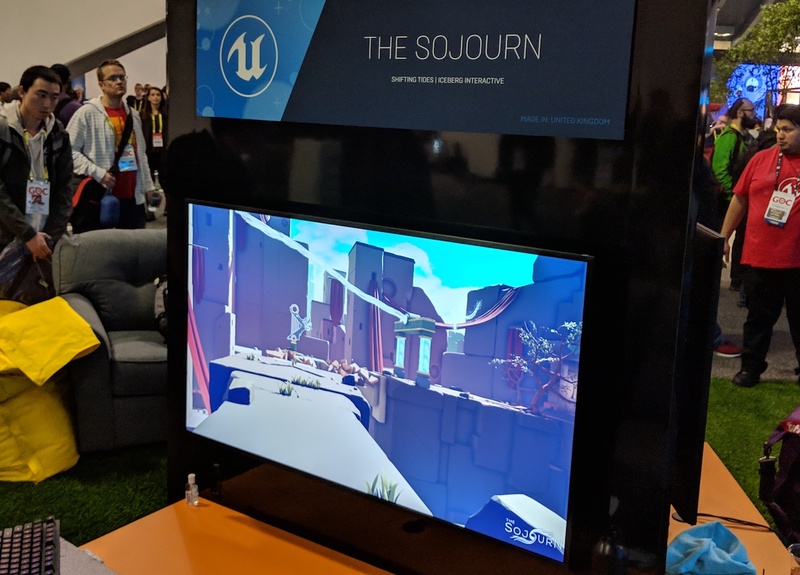 Unreal Engine had a bunch of games on display at their booth in the exhibitor’s hall, but the only one I had time to stop and play was The Sojourn — a first-person puzzle game from Iceberg Interactive and Shifting Tides. Think Portal , but with slightly different puzzle mechanics and no snarky robots. In the roughly 10-minute demo I learned how to navigate platforms by leveraging a unique teleportation mechanic: the player can enter a sort of “shadow world” to make certain platforms appear, but time in the world is limited, and while it’s possible to swap places with magical statues placed throughout the level. To get to the door at the other end of each room, I had to manage the locations of both my character and the statue, placing the statue onto switches to trigger changes to the level while ensuring that I was also placed in a position where I could make it to the door in time. I found the game satisfying and relaxing in the way many good puzzle games are, in no small part thanks to its crisp, sunlit environments and ancient, vaguely Middle-Eastern architecture. The devs say it will be out this year, so it may be worth a look when it drops on PS4, Xbox One, and Steam. I stopped by the booth for my alma mater, Rensselaer Polytechnic Institute, where I tried out one of the games on display from local Troy, NY studio First Playable Productions: Cards Against Calamity . Unfortunate name aside, it’s an educational card game (available both physically and digitally) created on behalf of the Environmental Law Institute and the Woodrow Wilson Center think tank that places the player in the position of a mayor of a coastal town. Each turn, players are faced with a choice between two policies, such as whether or not to sell a piece of land to private developers, and your choice affects the stats of the town. The eventual goal is to protect the town against catastrophic climate change events such as flooding through prudent public policy. 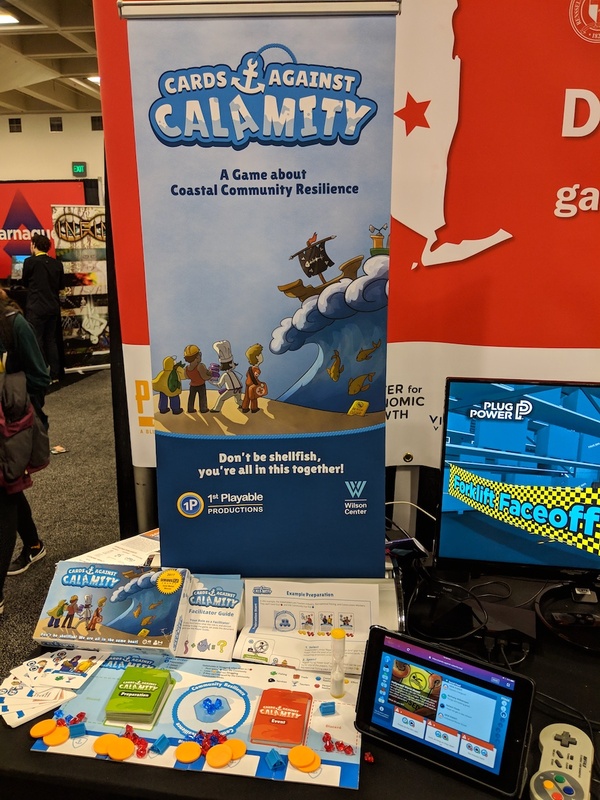 I only played for a little bit, but I could definitely see how it could provide lots of opportunities for stakeholders in coastal communities — the primary audience according to the game’s press materials — to discuss the impacts of their decisions. I unfortunately didn’t see much in the way of radical political solutions to the town’s problems (I wouldn’t expect the Woodrow Wilson Center to underwrite anything particularly left-wing after all), but I’m sure I missed out on a lot of options that appear in the late game. If you’d like to give it a try yourself, the entire game is available to play for free online! 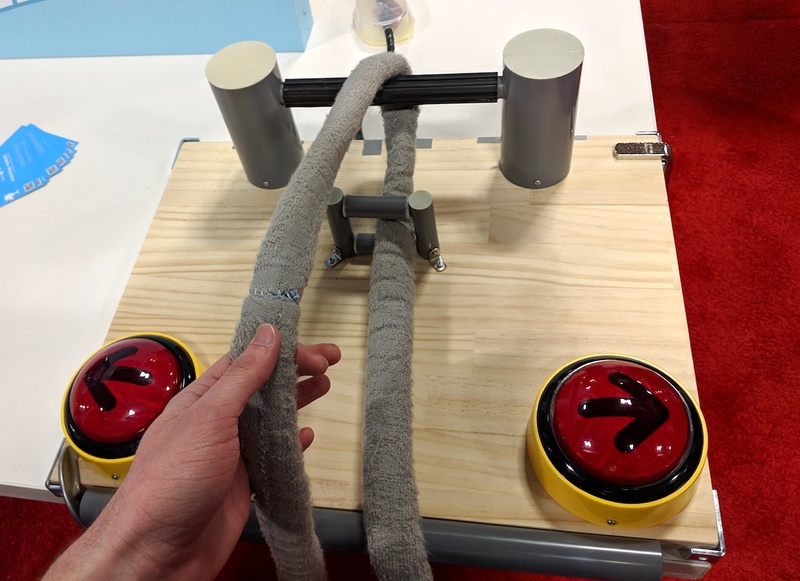 I played a bunch of games at alt.ctrl.GDC, the section of the exhibitor’s hall dedicated to games with alternative inputs. Ruins Climber was the first one I tried out, and it was a blast! The concept is simple: two players race each other up a wall by pulling on a loop of rope and pressing two buttons to move left and right to avoid obstacles. 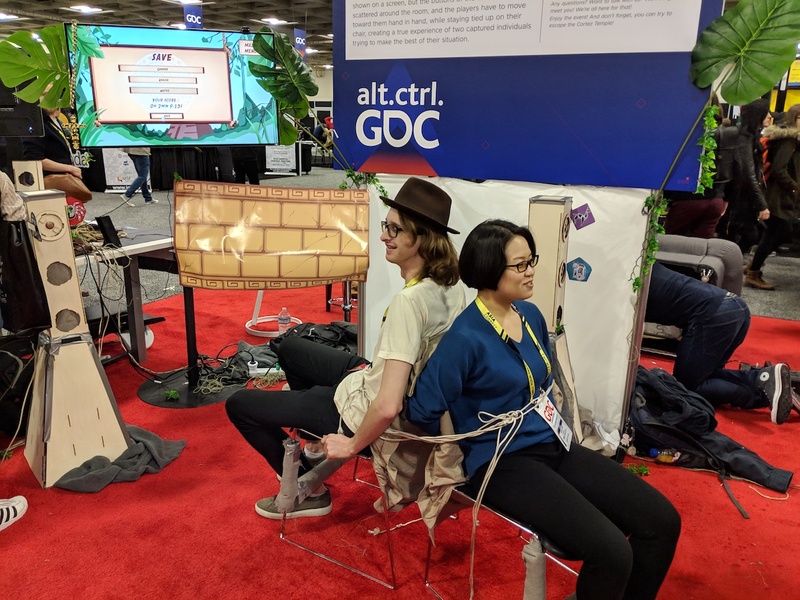 The wall and the obstacles are displayed in the video game (it’s worth clarifying — this is Alt.Ctrl.GDC after all), but the rope is real. Ruins Climber is the kind of delightfully competitive, slightly physical fun that makes me re-mourn the death of arcades here in the US, so it makes sense that it comes courtesy of Japanese developer Takahiro Miyazawa. I wouldn’t be surprised if this makes its way into some of Japan’s many arcades. This kind of game is what alt.ctrl.GDC is all about. Tied Escape is best described as an “Indiana Jones Simulator.” Bear with me here. Two players sit down on chairs in the center of the play area and someone ties the two of them together, binding their arms to the chairs. A screen overhead shows various combinations of colors, shapes, and icons with instructions for how to proceed. For example, “Press a red button and a button with a turtle on it at the same time.” It’s up to the two players to maneuver around while tied together and press the correct buttons on pillars around the play area, sometimes stretching their legs in opposite directions and nearly falling off the chairs! Tied Escape is stressful, fast-paced, and hilarious both to play and to watch. It’s basically an escape room but scoped to a much smaller set of interactions and fewer participants. I’d love to see more games explore ways to bring that escape room experience to other spaces, as it’s the kind of game that can appeal even to folks who don’t play a lot of video games. 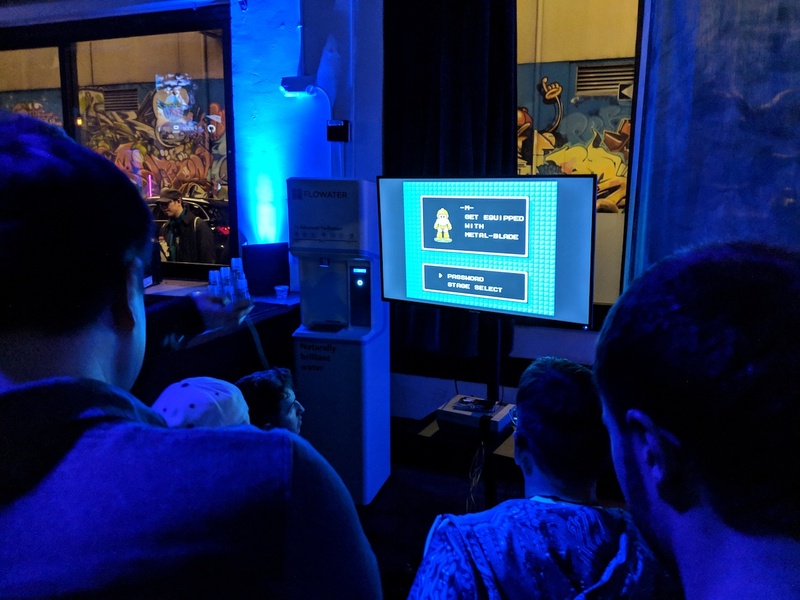 I played HOT SWAP maybe three or four times on the show floor and at Alt.Ctrl.Party, and already it’s one of my favorite party games. Two players attempt to cooperatively control a pirate ship as it fights off enemy ships and searches for sunken treasure, but the twist is that each player controls half of the ship using a modular controller. Each controller has two slots that can accept one of the buttons that control things like steering, speed, and cannon firing, but there are six buttons in total, forcing players to trade buttons in real time to get the ship out of tight spots. Like any good trust exercise, there’s a lot of yelling and freaking out, but when things work out and you manage to load and fire the cannons, steal some treasure, then jet away from the enemies alongside your partner, it’s absolutely sublime. I’m hoping the devs manage to produce and sell a mass-produced version of HOT SWAP , because I’ll be first in line to pick it up. Many of the games at alt.ctrl.GDC are party or arcade-y games, which lend themselves to the premise of alternate control schemes. Not The Book Ritual , which is more like an interactive art installation. 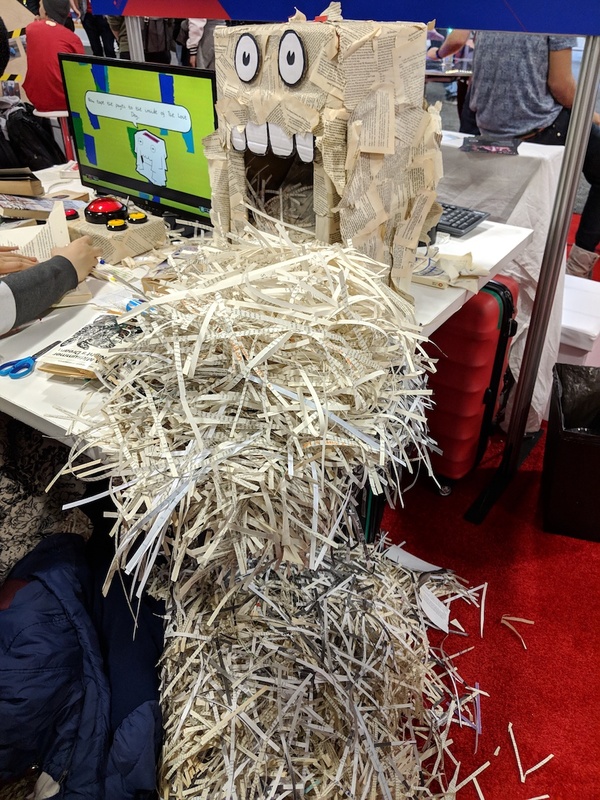 Made by Alastair Aitcheson, who specializes in such things, it’s a table piled up with books and a computer attached to a specialized paper shredder. Players pick a book from the table and start playing the game, in which a personified cartoon version of the selected book begins talking about itself, exploring its memories, and wondering whether it is just a sentient book or the soul of a person trapped inside a book. The twist? In order to progress the story, players must physically destroy the book, page by page. This includes ripping pages out and feeding them into the shredder as well as writing responses on the pages. The point, according to Aitcheson, is to explore feelings of loss, prompting players to talk about their feelings with an imaginary talking book while being responsible for the physical destruction of that same book. I only played the first chapter, so I didn’t get a chance to fully explore the story, but I could tell that The Book Ritual was going places. Even the introductory conversations veer toward dark territory — the book discusses the loss of a beloved childhood toy and asks the player to recount a similar experience. And on a personal note as a lover of books, shredding pages of The Lord of the Rings: Return of the King is a great way to make myself viscerally uncomfortable. There’s an online version you can download, but Aitcheson says that it’s a bit of an honor system where the game trusts that you’re actually shredding the book. I can confirm that the discomfort is well worth it. 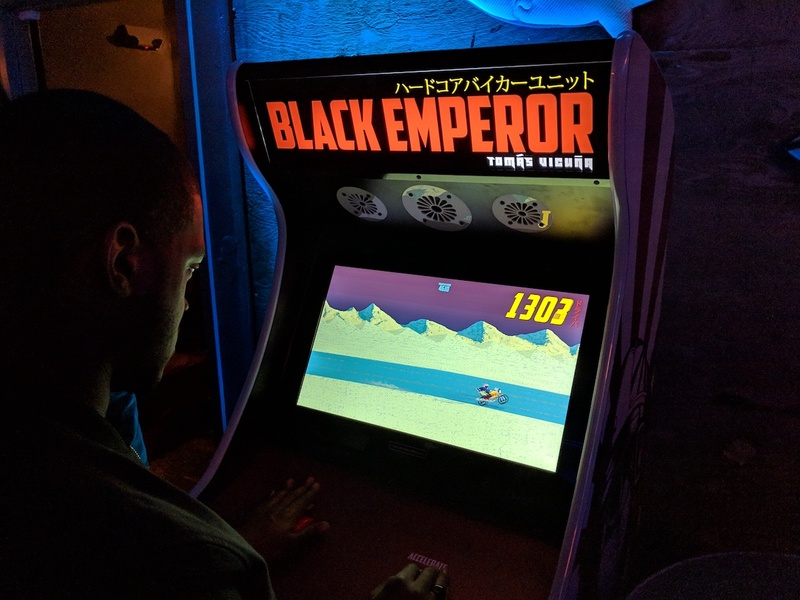 Black Emperor was set up in a modified arcade cabinet at alt.ctrl.Party (alt.ctrl.GDC’s end-of-con party) with just two inputs. This side-scrolling racing game from NYU grad student Tomás Vicuña makes players move a motorcyclist up and down using a vertical wheel and speed up with an “Accelerate” button to compete with other players to see how far they can get down the relatively straight course without hitting an obstacle. The gameplay is simple, compelling, arcade-y fun, but what really sticks out about Black Emperor is its slick, neon-tinged aesthetic. Inspired by “Japanese psychedelic rock and the Bosozoku motorcycle culture of the of ’70s,” it’s got a UI full of crisp, brightly colored Japanese lettering and a main game that’s rendered with detailed, slightly grimy-looking pixel art. This thing is just plain cool. I played this one last year and was impressed with how the simple act of splitting up an NES controller into eight controllers, each with one button, fundamentally changed the mode of play of classic NES games. Tetris was a raucous affair, with the team coalescing around specific roles as one player directed the others toward the optimal move. But most of the fun of Octopad comes out when things go wrong and everybody starts screaming at each other (good-naturedly, of course). This year we tried our hand(s) at Megaman 2 , with me handling the B button for firing at enemies. Things worked out surprisingly well until we needed to complete the most important task of all: navigating the pause menu to select the Metal Shot. You haven’t lived until you’ve heard eight people yelling about NES button presses for two minutes as they try to operate a menu. I know that sounds awful, but trust me, it’s a blast. I will never stop being impressed by the deceptively simple Line Wobbler . Described by some players as a “one-dimensional dungeon crawler,” it’s a sequence of levels featuring enemies and obstacles played entirely using an LED strip and a wobbly joystick controller. Players tilt the joystick to move up and down the LED strip and wobble it to attack in their attempt to reach the end of the strip. That’s it! The levels are nicely designed, with a sequence of escalating challenges leading to a final boss (yes, the one-dimensional LED strip game has a boss fight). 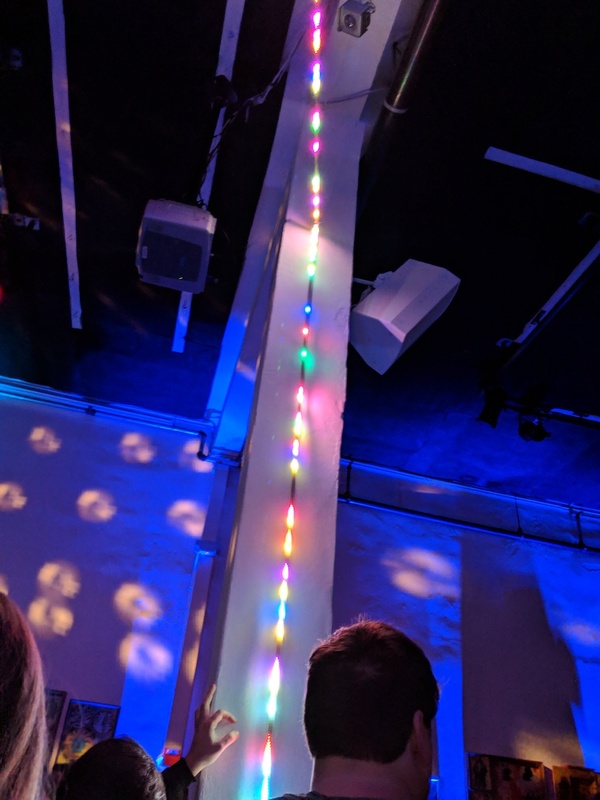 And there’s an added dimension to it thanks to the medium: Line Wobbler can be installed in different ways depending on the location. At last year’s alt.ctrl.Party it ran along a picnic bench and up a wall. This year it was attached to a column and part of it ran along the ceiling of the bar. So many video games are trapped inside of rectangular screens, so it’s pretty eye-opening to play a game that adapts to its play environment.